Reducing Immigration Is Not The Answer. Immigration is good for the economy. This doesn’t seem to be something which you hear very often. What with Nigel Farage’s constant statements of how an ‘Australian-style points system’ would solve all our problems, and Donald Trump’s rhetoric around the dangers of immigration, the positive case for immigration seems to be made ever so rarely. I aim to debunk some of the myths surrounding immigration and reinforce why we should vote to remain a part of the European Union on 23 June, with the unrestricted immigration from EU countries which this brings with it being a good thing for the UK economy, and the country as a whole. Myth One: immigration causes economic growth stagnation. It is often said that immigration is bad for the economic. However, this is simply untrue. Basic theoretical economics suggests that immigration in fact increases economic growth. In order to understand how immigration drives economic growth, only an understanding of very basic economics is required. The basic definition of economic growth is an increase in the output of an economy over a period of time, whilst economic growth can also be defined as an increase in an economy’s productive potential. As a general rule, most immigrants who come to the UK, come to the UK to work. These people are employed in a variety of roles within the UK economy. It may be that they are working in financial services in the City of London, they may be working as a doctor or nurse in the NHS, or they may be working as a labourer on a construction site. Growth in an economy’s work force, allows an economy to increase its potential output. When the level of immigration exceeds the level of emigration then this leads to an increase in the workforce. An increase in the workforce means that the economy’s productive potential increases as more workers means more output. Simple, right? The best way to illustrate this effect is by using a Production Possibility Frontier (PPF) graph. 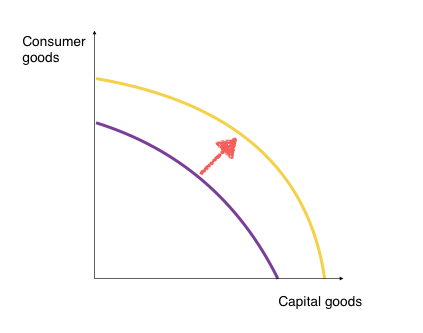 This graph illustrates an economy’s production level of consumer goods and capital goods and how an increase in the workforce can change the level of production. 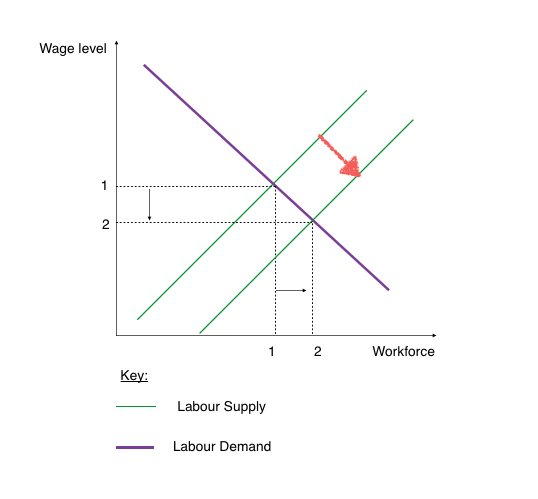 In this case, the purple curve represents the economy’s output level when only its original workforce is utilised. The yellow line shows how this level of output increases when new workers (in this case immigrant labour) are utilised and begin to contribute to the economy’s level of output. As shown here, immigration is clearly a key driver of economic growth. As previously mentioned economic growth is effectively an increase in the production capacity of the economy. An increase in the workforce as a result of immigration is clearly something which achieves this. In fact, it is often said that the government would not get close to its economic growth targets if it were to meet its immigration targets. Therefore, immigration clearly does not cause stagnation in economic growth. It is in fact extremely positive for economic growth. Myth Two: immigrants are a drain on our public services. It is regularly stated by campaigners for lower immigration that immigrants are a drain on our public services. In terms of the economic impact of immigration upon public services it is healthcare and education which are the most relevant public services to consider. It is often suggested that immigrants take advantage of the NHS and the UK’s state education system, whilst also claiming state benefits and therefore not paying tax. This would suggest that immigrants are a drain on our public services. It is often low-skilled immigrants from European Union countries who are particularly tarred with the brush of being a drain on public services. However, studies have actually suggested that the opposite is true. In actual fact, immigrants are net contributors to the government’s finances. A studyby Christian Dustmann of University College London and Tommaso Frattini of the University of Milan into the impact of immigration on the provision of public services found that between 1995 and 2011, EU immigrants made a positive contribution of almost £4 billion. This can be contrasted with a negative contribution of £591 billion by native Britons. From these statistics it seems clear who is the real drain on public services. As well as their net contribution to the public purse, it was also found that European immigrants were significantly less likely than native Britons to claim state benefits (eight percent less likely) and, less likely to live in social housing (three percent less likely). Therefore, from this standpoint as well, European immigrants are less of drain on public services than native Britons. The effect on the provision of services such as healthcare should also be considered. Whilst it is true that an influx of immigrants means that there are a greater number of people for whom healthcare must be provided which makes healthcare more expensive, it is not as simple as this. Most immigrants pay tax and therefore pay into the UK’s healthcare system just as any native British taxpayer does. In addition, it has been found that there is a high likelihood that immigrants will return to their homeland following retirement. This means that the NHS does not bear the high cost of providing healthcare to many immigrants in old age. Therefore, for these two reasons, to suggest that healthcare is more expensive as a result of immigration, is clearly wrong. It tends to be argued that immigrants lead to longer waiting times at hospitals and a less competent health service as a result. In actual fact the opposite has been found to be true. In a 2015 study by the University of Oxford’s Blavatnik School of Government, it was found that there was actually a correlation between increased immigration and lower waiting times. In Nottingham and Sheffield, cities characterised by high levels of immigration, hospital waiting times were among the lowest in the UK. Contrast this with Dorset and Herefordshire, both of which have very low immigration, where waiting times were around 50 percent longer. Therefore, the common perception that immigration increases waiting times at hospitals is clearly a myth. Finally, without immigration, the NHS would not be properly staffed. More than a third of the doctors in the UK were trained abroad, and the same is true of many of the nurses working in the UK. If we were to significantly reduce immigration then the NHS would not have enough trained medical staff to operate properly. Of course most of those who support a radical reduction in immigration will answer that the solution is simple — train more doctors and nurses! However, it is hard to see how the UK will suddenly, magically be able to increase the number of medical staff that we train. Successive governments have failed to train a sufficient numbers of doctors and nurses, and it is hard to see how this will change in the short to medium term. Therefore, immigration is necessary in order to keep the NHS running to a high standard. It seems clear that immigrants are not the drain on our public services that they are often made out to be. Therefore, we should not be using this as an excuse to reduce immigration. Myth Three: immigrants drive down wages. In theory an increase in the labour supply leads to wage depression. As shown on this graph, the labour supply increases which causes a fall in demand for labour as previously available jobs are filled. This fall in demand for labour subsequently leads to wage depression. 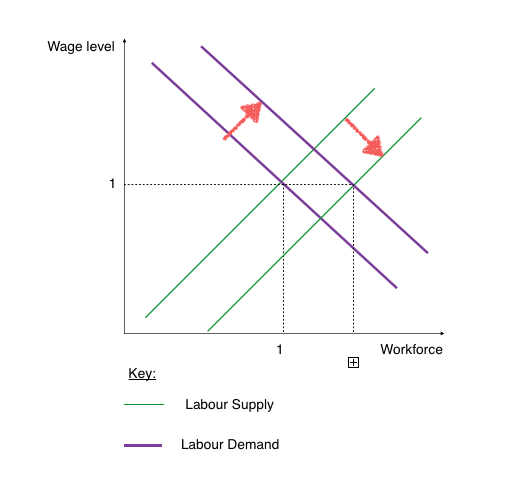 This graph shows how an increase in the labour supply leads to a subsequent increase in demand for labour, which keeps theoretically keeps wages at a stable level. Of course, this theory remains vulnerable to external shocks which can cause a wage decrease for the whole workforce as occurred as result of the recession. However, this is not something which is caused by immigration. Therefore, immigration is not actually the most significant cause of wage depression. Myth Four: immigrants caused the housing crisis. A common theme throughout the immigration debate and the debate around the UK’s continued membership of the European Union has been the perception that immigrants caused the housing crisis. This stems from the view that the increased demand for housing from immigrants has caused the housing shortage that the UK faces today. This suggests that the problem is one of demand for housing being too high. However, this is fundamentally wrong. The problem is in fact, one of supply. In 2004, the Barker Review of Housing Supply suggested that a quarter of a million homes needed to be built each year in order to guard against spiralling house prices and a shortage of homes. In 2007, this led to the UK government setting a target of building 240,000 homes a year until 2016. This target has not been met in any year since then, with the most successful housebuilding year being the 219,000 that were built in the year 2006–07. This lack of housing supply has been exacerbated significantly due the dramatic drop in new build property caused by the financial crisis. It is this legacy of the failure to build a suitable number of affordable homes that is hitting home now. It would be wrong to say that immigrants have no effect on the demand for homes, but their effect is negligible at best. This shortage in housing supply is likely to be exacerbated still further by the government’s extension of the ‘right to buy’ scheme which was announced in the Conservatives 2015 General Election manifesto. For right to buy to work properly the government must replace the social housing sold by building the same number of new houses. However, this does not happen. For example, government statistics show that 11,000 council houses in Cambridgeshire have been sold since 1980 under right to buy. Over this same timeframe, only 2,750 council houses have been built to replace them. The same is true all over the country. Ultimately, the housing crisis is a problem of supply rather than demand. Immigrants are not responsible for the long-term failure to build a sufficient number of houses. In addition, if immigration falls then the construction industry will be significantly harmed. All over the world the construction industry has always relied upon migrant labour, and the UK is no different. In the UK there are not enough Britons who are trained in construction, meaning that immigrant labour is required in order to fill the gap. Whatever your view on the causes of the housing crisis, there can be little argument that a strong construction industry will be vital to alleviating the problems with housing in this country. If immigration was capped, then the construction industry would be severely damaged and we may never properly recover from the housing crisis. In summary, immigrants were clearly not responsible for the housing crisis and are in fact key to solving it. There are many myths surrounding immigration, and immigrants from the European Union are routinely vilified as having a negative impact upon the UK economy and the country as a whole. However, this is not the case. I hope that this article has succeeding in debunking some of the myths which surround the effect of European Union immigration to the UK, whilst also making the positive case for immigration. Author jameswrigleyblogPosted on June 3, 2016 August 28, 2016 Categories EU Referendum, UK PoliticsTags Brexit, Business, Economics, EU Referendum, European Union, Healthcare, Housing, Immigration, Politics, UK Economy, UK PoliticsLeave a comment on Reducing Immigration Is Not The Answer.